Jug and bowl covers are a pretty and practical way to keep annoying insects away from your juice, milk and sugar. 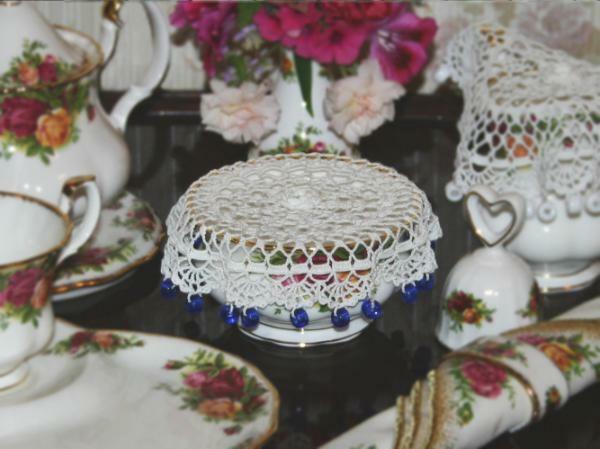 In the picture above the cover is shown on a sugar bowl and a milk jug. They are quick to make and are very acceptable presents. You will need 20 jug beads, pre-threaded onto your yarn for the last row. 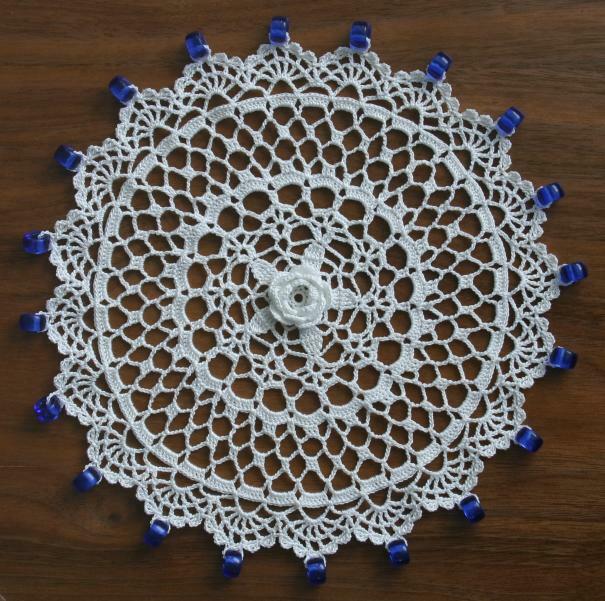 Leave off the beads and you have a nice small doily. The special aspect of this cover is the new rose I have created for the centre. 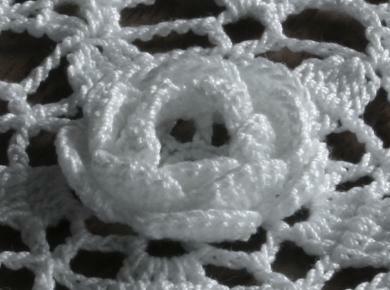 All the Irish Crochet roses I have seen have an even number of petals in each round and all the petals lie one-behind-the-other. Real roses are not like that, they have five petals in each round and successive rounds overlap. The lovely, old-fashioned 'globular' effect that this experiment produced reminded me of Bourbon roses - hence its name. 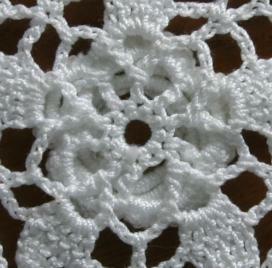 The cover measures approximately 17cm across, not including the beads. The jug beads are made of glass and are 8mm in diameter and 5mm thick. You can use larger or smaller beads. This 'slice' will help you to follow along with the pattern. This close-up of the Bourbon Rose shows how the petals overlap. This view of the rear of the rose will help you to see how it was constructed. As it is not done in the traditional way this illustration will help with the written instructions. More detailed step by step pictures can be found here.